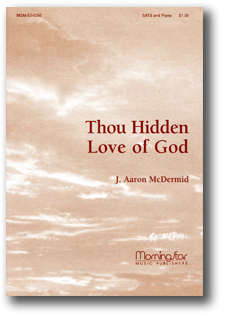 Thou Hidden Love of God » J. Aaron McDermid, D.M.A. Commissioned by: Chancel Choir at First United Methodist Church – Ann Arbor, Mich.
And inly sigh for thy repose. My heart is pained nor can I be at rest until I rest in thee. May ceaseless Abba, Father cry. I am thy love, they God, thy all!